A wide barrier didn’t stop outstanding colt Written By winning the 2018 Group 1 $1.5m Ladbrokes Blue Diamond Stakes (1200m) at Caulfield today. Written By, above, scores dominant win in 2018 Ladbrokes Blue Diamond Stakes at Caulfield. Photo by Ultimate Racing Photos. Written By ($5.50 favourite) jumped form gate fifteen in the sixteen horse Ladbrokes Blue Diamond Stakes field but that didn’t deter jockey Jordan Childs who let the colt cross from the wide gate to sit outside of the leader Crossing The Abbey. Childs still had a lap full of horse on the home turn and Written By toyed with his opposition in the straight to record a two and half lengths win over the Lindsay Park trained Enbihaar ($21) who jumped from the outside gate. 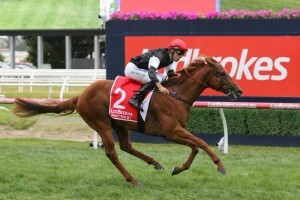 The Tony McEvoy trained Oohodd ($9) also race a brave race for third just in from of Prairie Fire. The Grahame Begg trained Written By was backed into favouritism on the strength of his last start win in the Group 3 $200,000 Ladbrokes Blue Diamond Prelude (1100m) for the colts and geldings at Caulfield on February 10. Begg said that there a possibility the Written By will now head to Sydney for the Group 1 $3.5m Longines Golden Slipper Stakes (1200m) at Rosehill on March 24. “We will let the horse do the talking for us. He will have a very easy week coming up. A month in between runs, We’ll see,” Begg said.